The Solo-Fill from Tong Peal is the economy model big bag and box filler. A flighted belt elevator powered by a fixed speed motor delivers the crop to the cascade lowerator. Elasticated bag handle holders are fitted to the elevator to hold the bag during filling. The powered cascade is lowered into the bag by pressing the 'down' button on the electric panel. It lowers into the big bag. When fully extended a crop sensor 'starts' the feed elevator belt. 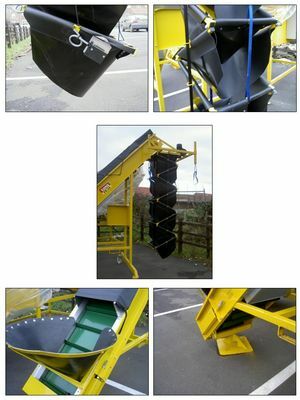 As the crop enters the bag the crop sensor automatically lifts the cascade and stops the feed when the big bag is full. As shown in the picture when filling boxes a swivel base and caster wheels are available which allows the system to move between boxes. These minimise the changeover time between boxes. Click here to email for additional infomation.